LORD® provides solutions for the assembly, sealing and protection of your electronic components used in the most demanding settings. With bonding, sealing, gasketing, potting, encapsulation and vibration and motion control products, we are able to protect your sensitive electronic components at all points. LORD® solutions have been field tested to provide high quality and long-lasting protection for your ruggedized electronics needs. 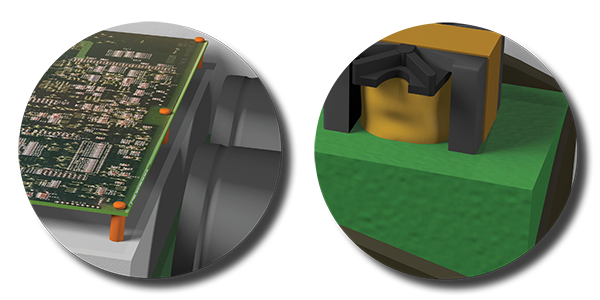 Protect circuit boards from shock and vibration with LORD Micro-Mounts™. LORD potting and encapsulation materials protect electronic components from environmental elements.